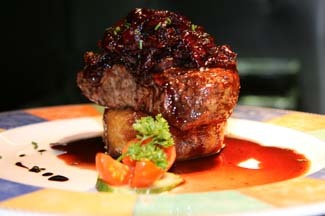 Seats 70 (Private room upstairs, 26; outdoors, 10); D Mon-Sat 5-11, L Sat & Sun only; Sat & Sun all day, 1-10pm. 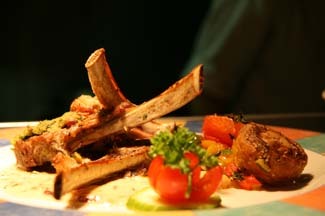 Early D Sun-Thu all night, Fri/Sat 5-7pm, 2/3 course €19.50/23.50. House wine €19.95. Wheelchair accessible; children welcome (childrens menu). Closed 25-26 Dec, 1 Jan, Good Fri. MasterCard, Visa, Laser. 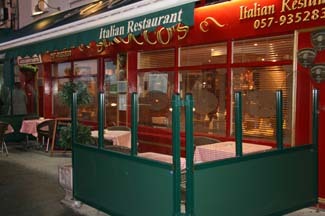 Conveniently located right in the centre of Tullamore town, this deservedly popular Italian restaurant is owned and managed by Paula Moran-Tahraoui, formerly of the well-known Senor Rico Restaurant which she ran in the same premises with her late husband, Rico. 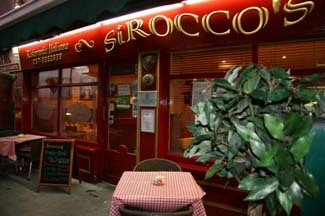 SiRoccos is warm and welcoming, with the arches, plasterwork and soft colouring that make such a good setting for classic Italian food, and the team seems to be almost all-Italian, giving it a great Italian buzz mixed with a friendly Irish style. Once seated, a jug of iced water and a complimentary basket of good bread is placed on the table while you choose from an extensive, typically Italian, menu featuring a wide range of dishes arranged by starters, pasta, pizza (some unusual ones there, named after fashion designers, cars etc) and meat/chicken/fish. A real bonus is that many dishes can be ordered as a main course or as a (generous) starter. Everything is cooked order and you can watch the four Italian chefs working in the open kitchen as you wait for your order to arrive. You might begin with a well-made minestrone, classic antipasto misto, or a freshly cooked and tasty warm chicken Caesar salad. An excellent creamy risotto marinara (perfectly cooked rice and lots of seafood - squid, prawns, scallops, mussels etc), works equally well as a starter or light main course or, if you prefer pasta, you might try linguine fruiti di mare (fish & shellfish in garlic & herb tomato sauce). Main courses include classics like veal Marsala and chicken cacciatore, and also plenty of steak dishes - no wonder this place is such a favourite with locals, who appreciate the good food and service, atmosphere and good value. 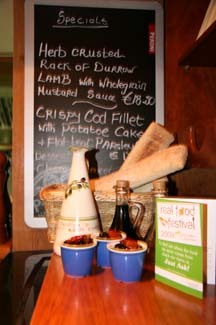 Finish with a classic Italian pud, or one of a few Irish specials offered daily, like crumbles and tarts, and good coffee. 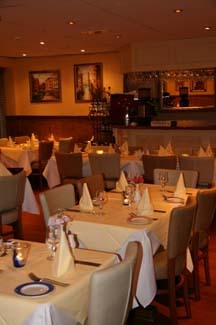 Service is spot on and professional, it’s very family friendly and offers good value for money – visitors to Tullamore would be glad to find this place.